The Sax Institute was established in 2002 as the Institute for Health Research. In 2005 we changed our name to better reflect our role. 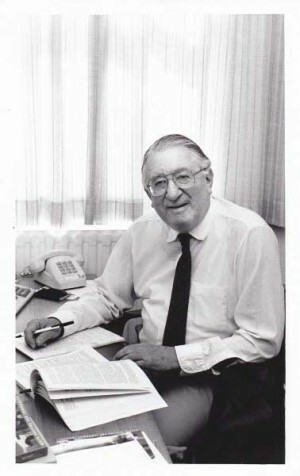 We are named after Dr Sidney Sax, a major leader in public health and health services reform. Dr Sax established innovative research programs in these areas and his work exemplifies our mission to improve health, health services and programs by increasing the use of research in policy making. In 1960 Dr Sax arrived in Australia from South Africa, serving as a physician and deputy medical superintendent at Garrawarra and Lidcombe hospitals before becoming Director of Geriatrics for NSW in 1964. He worked primarily as a geriatrician and was a great advocate of aged care assessment teams long before they became generally accepted. He was also strongly in favour of community care to help older people retain independence in their own homes. As the first Director of the division of research and planning in the NSW Department of Health he created data sets that for the first time allowed for basic health services planning, including the beginnings of the hospital morbidity data collection. In December 1972 Bill Hayden, the then Minister for Social Security, approached Dr Sax to set up and head the Hospitals and Health Services Commission, where he remained until the Commission was disbanded in 1978. Under Dr Sax’s leadership, the Commission pioneered Commonwealth involvement in health services delivery. It developed policies concerning the supply and distribution of health services and established a national health service planning model. The model envisaged a network of services comprised of primary care, private specialist care, hospitals, nursing homes, hostels and rehabilitation and domiciliary care. Primary healthcare was of central importance. Dr Sax played a key role during this period in the development of Medibank; he convinced Prime Minister Whitlam to work cooperatively with the states to provide Commonwealth funds for public hospitals conditional on the states guaranteeing free and universal access. Together with the Medical Benefits Scheme and the Pharmaceutical Benefits Scheme, this ensured comprehensive universal insurance, similar to the current Medicare system. In 1982 he was awarded a CBE, or Commander of the British Empire, for his services to health in this country and, in 1983, he became a Visiting Fellow at the ANU. Under the Hawke Government, Dr Sax became the founding Chairman of the National Health and Medical Research Council’s Public Health Research and Development Committee in 1987. He wrote many books and peer review papers about health and health policy. Dr Sax died in 2001.